Showers in baths, toilets that are low and/or without handrails, doors with heavy springs….architects really have no idea when it comes to kitting out hotels for disabled people. They do not account for people who are ‘ambulant disabled’ and give scant consideration to those in wheelchairs, and forget that the disabled person will quite possibly have a partner/carer who will be able-bodied. 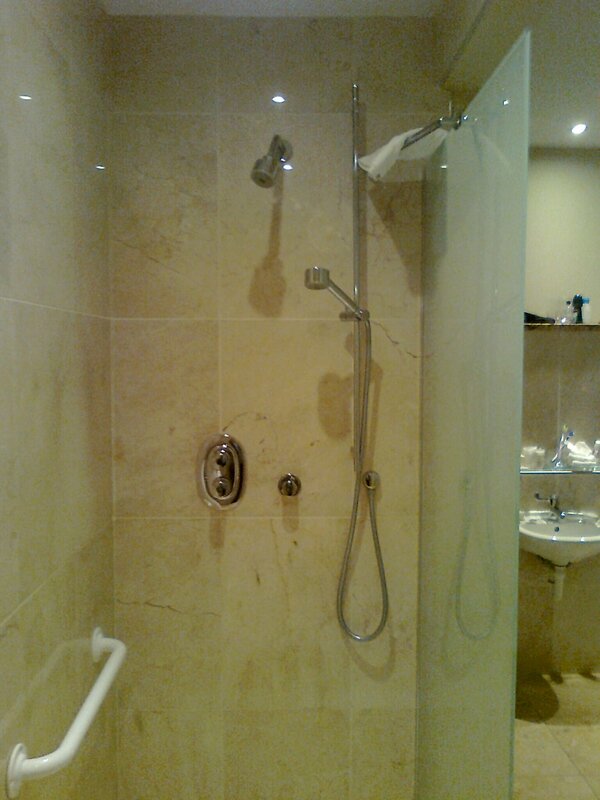 I always ask for an accessible shower, explaining that it must have level access (not a shower in a bath) or a ‘wet room’. Mostly, I find that the shower is in the bath! This is considered accessible?! My worst experience was in a well known and respected hotel in Westport, Co. Mayo. At first glance, it appeared to be a well appointed bathroom. That is, until one wanted to, for instance, use the bath mat. This was positioned on top of the dividing wall for the shower area, and was approx 6’6″ high, and for many people with mobility issues, the bath mat is vital. The only shelf on which to put ones toiletries was also almost 6′ high. There was no provision for a partner/husband. My husband, 6’2″ tall, had to use a chair in order to get low enough to use the basin in order to shave. The shaving mirror was also really low – there was no other mirror. 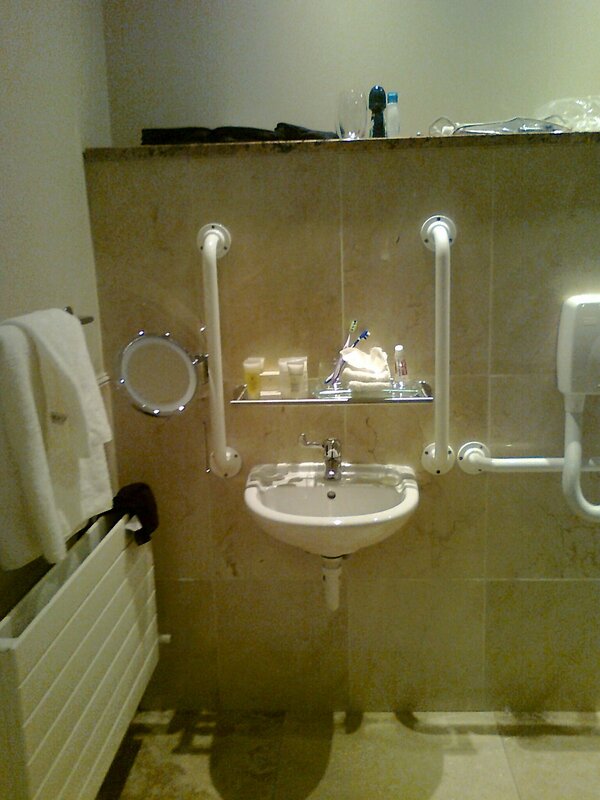 It simply never occurs to people that a disabled person might have an able-bodied partner who would require a basin at a normal height with a mirror also. Most Disabled Loos have those ridiculous, tiny basins, with spray taps that only allow a very slow spray. In other words, useless. Why on earth people think that we wouldn’t be able to wash our hands normally, I do not know! And sometimes they are so small there isn’t even room to get ones head down low to brush ones teeth! 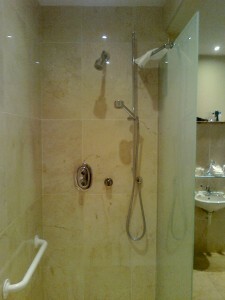 I have been offered lovely huge baths, but not a handrail in sight, making them totally unuseable. The shower-chair is sometimes positioned at a distance from the shower,which is impossible for a wheelchair user to cope with. Even though I always request disabled facilities when making my booking, we usually find that the first room we are shown on arrival is a ‘normal’ room, which means that we have to go through the whole palaver of going back to reception and insisting on an accessible room. Having travelled extensively, I have found the UK to be the worst when it comes to such requirements, mainly because so many hotels are very old buildings. The British still want their bath, while the rest of the world takes a shower! I firmly believe that, before a building is passed as accessible, the architect should have to work through the building in a wheelchair. This should be done from the car-park in, and throughout the building, and include turning lights on/off, opening and closing doors etc. For instance, try opening a door that has a heavy spring on it, while sitting in a wheelchair! This entry was posted in Articles and tagged accessible tourism, disability Ireland, disabled tourists, wheelchair facilities Ireland. Bookmark the permalink. It is troubling how difficult travellers and tourists that need basic access when travelling but struggle to find it.